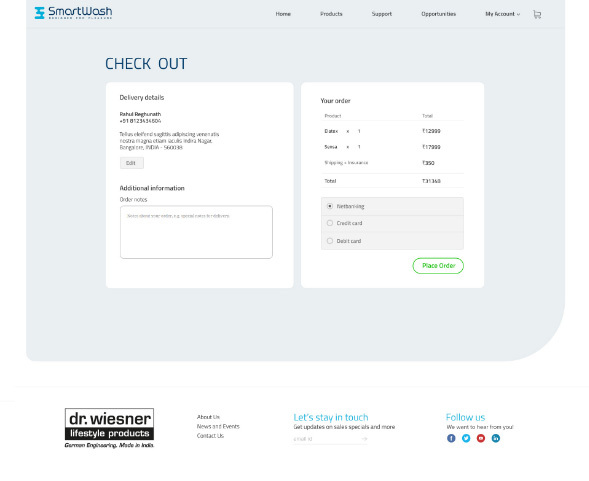 Dr. Wiesner Test & Automation Pvt. Ltd., from Germany is a wholly owned subsidiary of Dr. Wiesner Steuerungstechnik. 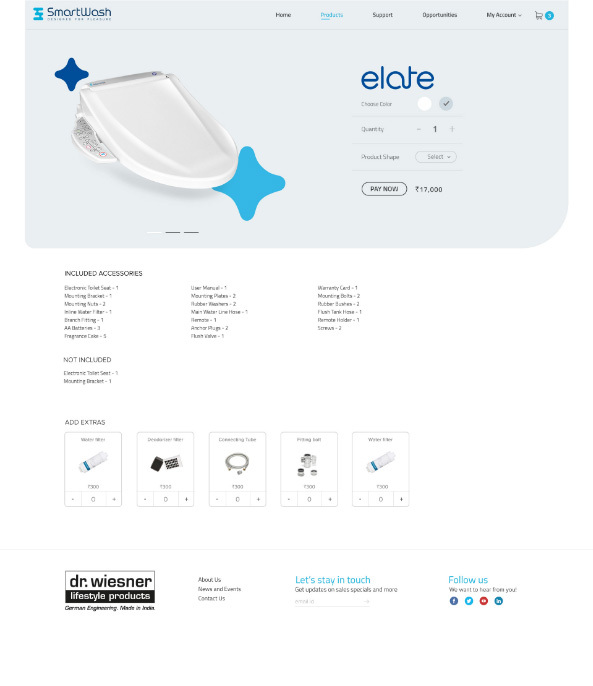 For more than 50 years, Dr. Wiesner has enjoyed a strong global presence and is now entering he Indian market with a revolutionary lifestyle product, a smart toilet seat called SmartWash. 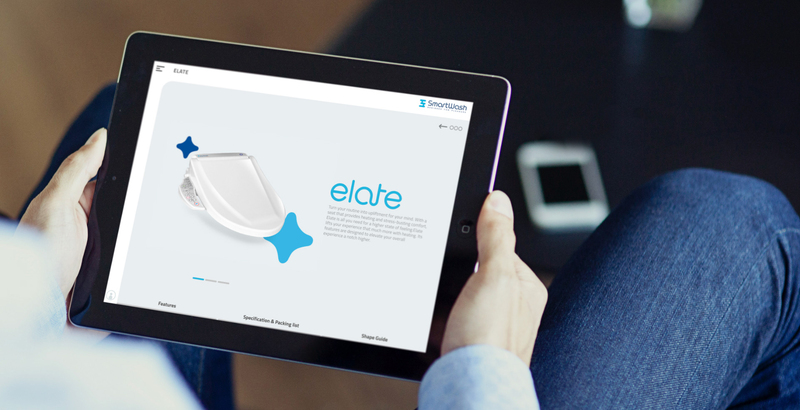 Providing an innovative and hands-free experience, SmartWash is set to conquer the last frontier of bathrooms. It allows you to experience a whole new level of hygiene and comfort. This revolutionary product comes in six smart variants; each of which has a host of advanced features, designed for pleasure. So have to launch first product in India. We need everything from branding strategy to product user interface to promotional communication. Work included Brand Positioning, Brand Identity, Product and UI design for the remote, UX/UI for the website and B2B portals, Product Packaging and Brand Launch. 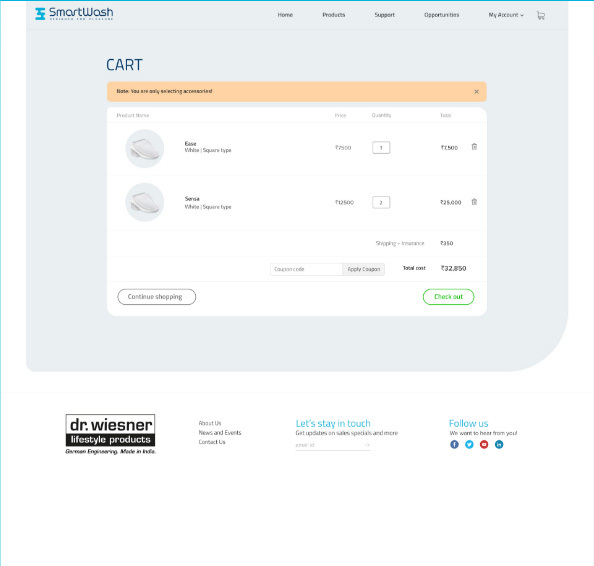 I have done the website and sales portal. It was challenging to create a full fledged plan for the project because it's new product in Indian market. 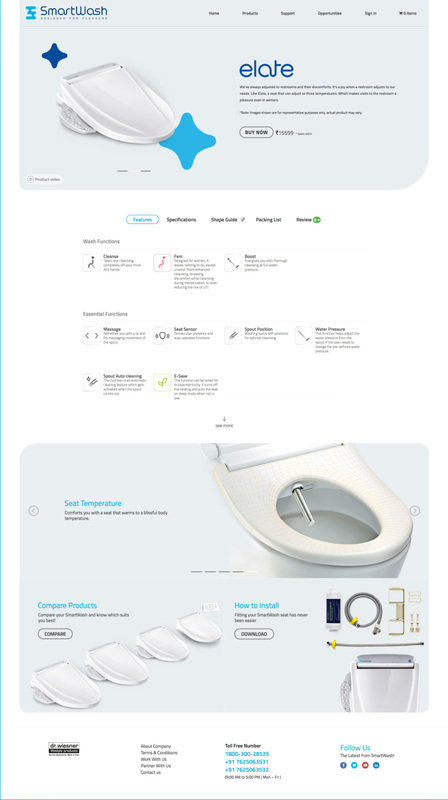 The product provide hygiene use of the toilet. So I have maintained clean look to a design by keeping a white space. 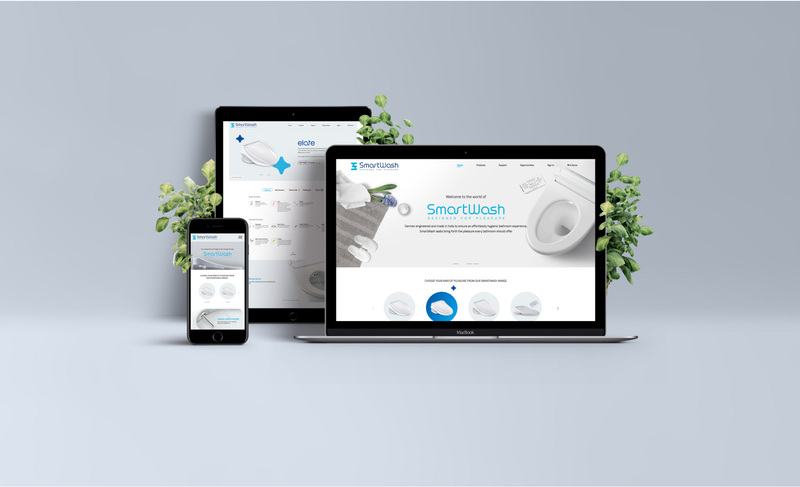 Smart wash logo inspired from water drop and repersent S. It has six variants we have created design language for each product by referring its behavior. It has a full-width hero slider for promotional and topical content. We have placed a carousel with all range of smart wash product and below we highlighted main key features by animating them. All the product looks the same but maintained variants design language for each product page. Those graphics made a major differentiation across all product page. The top banner section included product slideshow, Product video, logo, small description about the product and buy button with a price. Next section is the combination of tabs that includes features, specification, shape guide, packing list, and review. Also displayed highlighted features in slider along with comparing and how to install section. This microsite mainly for marketing people, to present to B2B customers. This responsive microsite is suitable for tablet and laptops. 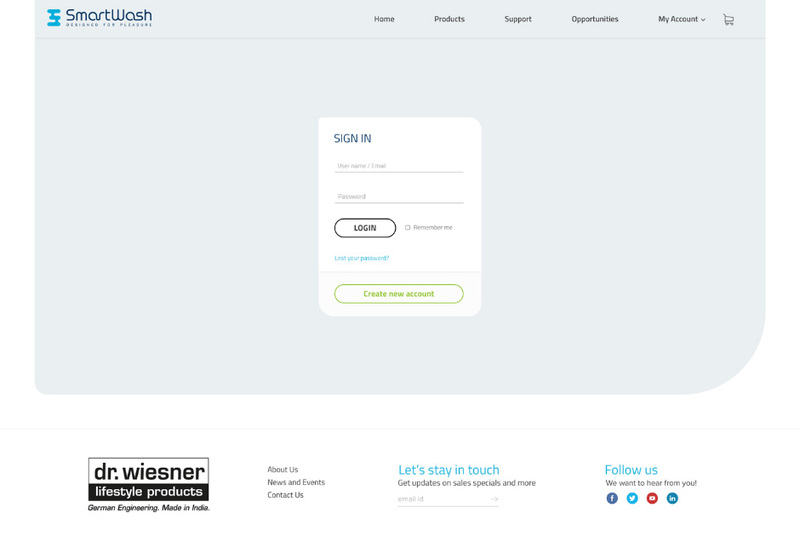 It has login function, each marketing people will have unique login details. It can save customer details and their preferred product. Marketing people can generate an immediate invoice for customers and share with customers through email.